So I am patiently awaiting the DVD arrival of the best cult classic animated series of the 1990s and perhaps the best cartoon of my youth. Thank goodness for the Amazon gift certificate. To those of you not in the know, it was a series that permanently warped me in the best possible way. It took the idea of a superhero and turned it completely upside down. In the words of Hunter S. Thompson, the series was "Too weird to live, and too rare to die." Sprung from the minds behind Tiny Toons and Animaniacs, Freakazoid ran for two seasons from 1995 to 1997. 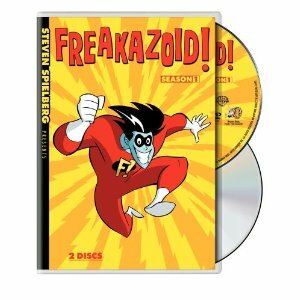 While I enjoyed all three series, Freakazoid had an acerbic wit that was a little sharper and more bitter than its contemporaries. It was the kind of comic genius that couldn't quite capture the minds of the kiddies and not fully engage the attention of adults. EDIT: my Dad actually remembers more of this show than I did now that I have the DVDS in my clutches. For some reason I remember him not liking it very much, but apparently he did...huzzah! The plot (on the occasion it had one) revolves around Dexter Douglas, who gets sucked into the Internet and is given all of the information from the worldwide Web (which was even back in its earliest days was a pretty weird place), which in turn, makes a wise-cracking, fast-talking superhero out of him. The episodes pulled punches, making fun of nineties pop culture and politics with a kind of wild abandon. If Animaniacs pushed the envelope in that regard, Freakazoid tore right through it. One memorable episode shows Freakazoid hunting down a fellow driver just to tell him his tail light is out. When Freakazoid tells him he has to give him a ticket, the man takes it and it reads "One free admission to the Jerry Springer Show" which causes the man to be rather traumatized. Executive producer Steven Spielberg even makes an appearance at the start of one episode (in his animated form) when the group of writers can't figure out what the hell they should make the episode about. I look at today's Adult Swim shows, particularly Venture Bros., and I realize the creators must have all watched Freakazoid a million times over. This show made random weirdness in cartoons hip long before Adult Swim even existed, and unlike many shows or movies, it can actually make me laugh right out loud. In its fun, likeable way, it held the world of the mid-90s accountable for all its crazy, silly actions. It's as if Freakazoid exists to say "Hey guys, I'm acting really strange and weird over here, but look at what YOU guys are doing!" It's a shame the show was cancelled, but perhaps if it had kept going it would've been too hot to handle. Can you imagine a show's cartoon theme song today ending with "He's here to save the nation, so stay tuned to this station. If not we'll be unemployed, Freakazoid!" Being cut a little close to the quick is not for everyone, and I understand that. But for those who can appreciate the artful balance between genius and insanity, this is the show for you. I can't wait until Friday when I blitz myself into a papaya-induced hallucination. The papaya juice scene reminds me of another way in which Freakazoid might be considered "ahead of its time": the whole "make something funny by taking a gag just a little too long" thing is a staple of Family Guy and other popular shows now, but I don't really remember seeing it much, if at all, back in the era when Freakazoid first came out. LOL okay okay fair enough. I just remember you not liking it all that much! I'm surprised you remembered good old C.J., one of the best villains ever. Needless to say, I now have the DVDs in my clutches, and god, it's even weirder than I remembered. I miss this show terribly. And my boyfriend is nearly frantic waiting for it to come out on DVD. I'd give it to him for Christmas if I thought he could go that long without taking somebody at Best Buy hostage. Amanda, it's out! Go get it!